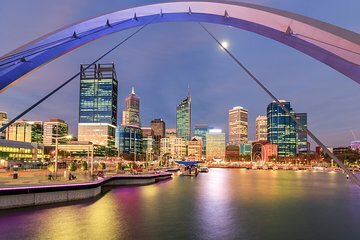 Watch the sunset over the Perth skyline as you float down the Swan River on this 90-minute evening cruise. Listen to the live commentary as you glide past landmarks like the Crown Casino and Old Swan Brewery, admire the glittering waterfront of Claisebrook Cove, and enjoy a complimentary glass of wine as you soak up the views. Great trip on calm waters with panoramic views of the city. Twilight gave excellent photo opportunities. Our group of 7 have really enjoyed river cruise. Complimentary wine was great. You could also purchase a cheese board and nibbles. Highly recommended. We would highly recommend this tour next time you are in Perth. My husband and I were running late and they kindly waited for us. We had a couple of drinks and ordered a cheese platter as well. So pretty along the river, the perfect way to see some more of Perth. tour was very good but you need to start a little later , it was advertised as seeing the night lights but only saw the lights for a very short time as only got dark a few minutes before cruise finished, this was disappointing.